The cheese brand Finlandia has commissioned this “Cheeseware” to commemorate Finland’s independence. Wine and cheese is pretty much the original food and drink pairing, but Finnish cheese brand Finlandia is bringing these two delicacies together in a far out way you’ve likely never seen before. 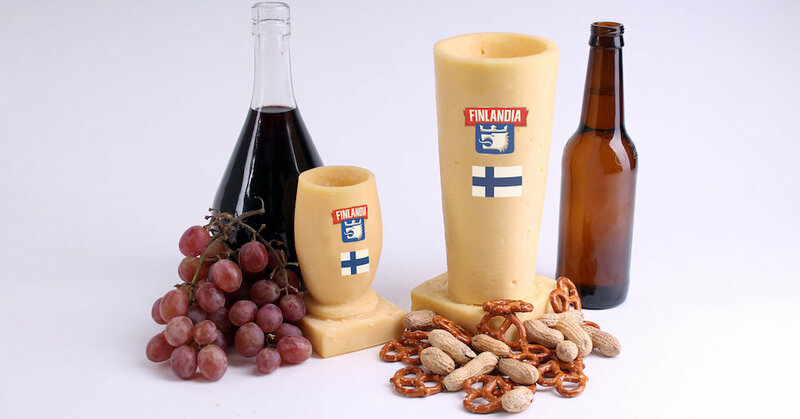 To celebrate the 100th anniversary of its namesake homeland’s independence, Finlandia commissioned a set of Commemorative “Cheeseware” – a wine “glass” and a beer “glass” literally made from cheese. Though the concept might strike some as figuratively cheesy, these dairy-based drinking vessels are meant to be taken very seriously. First, each glass will be handcrafted upon request by food sculpting couple Jim Victor and Marie Pelton. Second, the cheeses being uses weren’t chosen on a whim. The 8-ounce stemless wine glass is sculpted from Gouda specifically intended to pair well with merlot or other big red wines. Meanwhile, the 16-ounce beer glass is crafted from Gruyere which is recommended for filling with either a stout, bock or wheat beer. Needless to say, a serious product should come with a serious price tag, so Finlandia is selling these one-of-a-kind items for $5,000. For those interested in throwing down 5K on this ultimate wine (or beer) and cheese pairing , Finlandia says the glasses will be sold for one day only – December 6 – and all requests should be made via direct message on the brand’s Facebook page. Since each glass will be crafted once ordered, in theory, there’s no limit to how many of these pricey glasses you could buy. But just make sure you save yourself a bit of money for the wine: There’s nothing more gauche than filling a $5,000 edible wine glass with a $6 merlot.